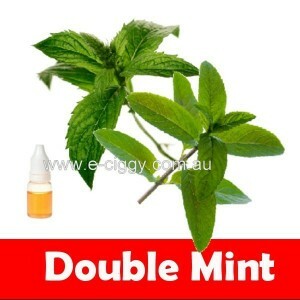 A slightly sweet, mildly mint flavour in one delicious blend. You’ll recognize the flavour of E-juice Double Mint as it was created in the likeness of those familiar green packs of gum. The flavour lingers in your mouth as the vapour hits your lung - two flavours and two levels of sensory gratification. Double your indulgence with this succulent liquid meant to be savoured. To enjoy e-liquids, smokers will need to learn how to care for them. For those users who are new to storing and caring for e-liquids, it is advisable to purchase quality e-liquids which are available at our store. Proper storage is pivotal for users who order e-liquids in bulk. While bulk orders can be an economical option, it is crucial to note that e-liquids do not last forever. The typical shelf life of e-liquids is around two years. E-liquids may be fine after two years, but the quality and flavour would be degraded. Because e-liquids are sensitive to light and heat, it is important to store the bottles of e-liquids in a cool and dark room away from strong direct sunlight. This will ensure that your e-liquids taste fresh and good all the time. For those smokers who have extra space in the refrigerator, keeping the bottles there can also a good idea. Alternatively, you can keep them in the basement or in cabinets. When opening the bottles of e-liquids, try to open them indoors as sunlight and heat will weaken the flavour of the liquids. For smokers who buy ingredients separately, it is best not to mix them until you actually use them. Keep the flavouring and base in different bottles to keep the ingredients fresh. We store our products in plastic bottles or glass bottles. For long term storage, one should opt for dark glass bottles to keep them in tip-top condition. Dark glass bottles can prevent the light from shining through the liquid, keeping the e-liquids fresh and good. Plastic bottles can be good for short term usage, but are not advisable for long term use. Experienced users will not use plastic bottles to store e-liquids because it will destroy the quality and formation of the e-liquids. During the process of storing e-liquids, try not to let the air get trapped inside the bottle. If you notice that the e-liquids get darker with storage, it means that they have gone bad with oxidization. It may not be a health hazard to use e-liquids that have gone bad, but the taste and quality rapidly declines. Alternatively, purchase in smaller quantities if you find that your e-liquids start going bad.